Couches and coffee table – complete with indoor plant and coffee table books – took centre stage for the opening concert of the UKARIA Cultural Centre’s third UKARIA 24 Festival. Casually dressed musicians – percussionists from the Australian Youth Orchestra’s Momentum Ensemble – came and went, reclining and chatting as the audience assembled. John Cage scored his 1940 piece Living Room Music for percussion ensemble playing “any household objects or architectural elements”. From his reclined position in UKARIA’s brand new living room, Momentum’s Jeremy Sreejayan casually slapped the side of the couch, launching – along with Fraser Matthew, Thomas Robertson and James Knight – into a rhythmic, entertaining performance that fully embraced the theatre of Cage’s music. Knuckles rapped on the coffee table while a plastic jug and tiny teapot (the lid whipped off with a flourish) added their unique timbres to the polyrhythmic mix in the first movement, To Begin, while Story – which draws its musical elements from the text of Gertrude Stein’s children’s poem The World is Round – saw the quartet declaiming from the coffee table books. For the third movement, the musicians moved to a table of children’s toys, bright coloured rattles and plastic spring-loaded play stations accompanying a toy-like melodica, which took the movement’s titular Melody. While pots and pans might imply a clamorous sound world, the quartet played them with great subtlety in the finale, at a kitchen bench on the other side of the stage, building a groove of soft fingertip attacks and salt and pepper shakers to a heavier, ladle-wielding climax. It might seem incongruous to pivot from Cage and kitchen implements to Haydn’s First Cello Concerto, but this was a program that deliberately created a dialogue between the music of the past and the music of the present – and the festival’s curator, cellist Nicolas Altstaedt, made it work. Most recently in Australia touring with Serbian pianist Aleksandar Madžar for Musica Viva, Altstaedt – who is artistic director at the Lockenhaus Chamber Music Festival in Austria – led the Momentum Ensemble in a performance of the Haydn that very effectively kept a foot in both worlds. Altstaedt brought a charged, earthy sound to his solo lines that cut easily through the sound of the chamber orchestra to fill the UKARIA concert hall, standing and turning to conduct the Momentum Ensemble, who in turn thrived under his direction. He imbued each phrase with life, using vibrato only sparingly and decoratively, his flourishing ornaments dispatched with lively spontaneity. His cadenza brought us back into the present day, with a smouldering solo full of tremolos and harmonics, riffing on Haydn’s material in a contemporary idiom. He brought clean lines and long breathed phrases to the Adagio, in a passionate, almost Romantic, reading that demonstrated you don’t need vibrato to play espressivo. If the intonation and blend of the Momentum strings felt, for the only time in the program, anything less than perfectly immaculate in this movement, they distinguished themselves in the finale, which Altstaedt took at a fiendish pace. Treating his cello like a folk fiddle, Altstaedt drove the Momentum musicians before him in a stunningly virtuosic performance that skirted thrillingly close to the edge without ever falling over it. Past and present again mingled in the second half of the concert, which saw Altstaedt joined by Norwegian violinist Vilde Frang in a performance alternating JS Bach’s keyboard Inventions with selections from contemporary German composer Jörg Widmann’s 24 Duos for Violin and Cello. The pair brought a fragile, intimate sound to the first Invention, in complete contrast to the fierce intensity of Altstaedt’s Haydn – and to the jagged violence of Widmann’s Duos. 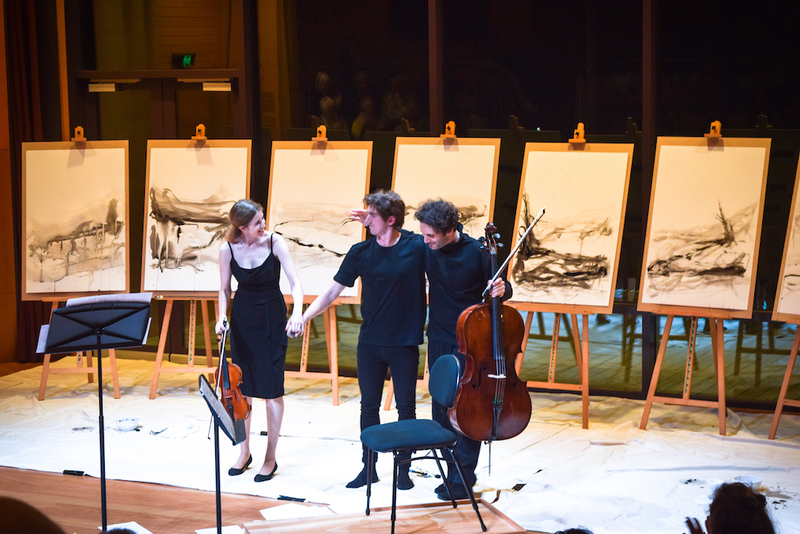 Australian artist Angus Hamra joined the musicians onstage, painting with water, black ink and charcoal, a work across eight easels. Hamra became the third player in a trio, his abstract landscapes taking shape in response to the music – during the Bach Inventions he was largely contemplative, preparing brushes and standing back to assess his progress, while the Widmann spurred him to life. The sparse, eerie quality of Widmann’s Fifth duo saw dilute, translucent lines take shape on the page, while the harsh twang of Duo 20 prompted hard flicks of blank ink to splatter against white paper – a sighing descent in violin and cello became an arcing descent of the brush. Sándor Veress, whose Transylvanian Dances capped off the concert, has his own connection with Adelaide: the Hungarian composer (who studied with Bartók and Kodály) was composer-in-residence at the Elder Conservatorium in the late 1960s, teaching, among others, the young Ross Edwards. The Momentum Ensemble took the stage once more, with Altstaedt leading the cellos, for Veress’ lush, folk-infused dances (with canonic moments harking back to the Bach), which featured wonderful solos from Concertmaster Nicolas Waters, Altstaedt and violist William Clark. Here the Momentum strings were in fine voice, their sound rich in the warm acoustic of UKARIA. The vigorous finale – the final of the four dances is titled Dobbantós, which means ‘stamping’ – was a lively conclusion to a fine concert. This was a fascinating program artistically, but it threw up some logistical challenges, with extensive stage resets sapping some of the evening’s momentum (the percussion quartet received another round of applause when they returned as removalists to carry off the couches). But ultimately it paid off: Altstaedt’s energy was infectious, his passion and musical charisma making a complex and intelligent program not just satisfying, but utterly compelling.